Customer from Washington writes "My greenhouse was quite a distance from any water source and the design of the greenhouse did not support the usual rain gutter catchment system.... I came across your product... and I knew that it was the solution I had been looking for! I placed two saucers with rain barrels on the backend of the greenhouse and ran a connection hose through to the greenhouse interior. With the amount of rain I get in the Pacific Northwest my rain barrels are usually full no matter how much I use on my plants inside the greenhouse. It is also comforting to know, should I ever need it, that I have a clean source of drinking water! Thanks for creating such a great product!" "The saucers are working out very well for us. It assists us with placing gardens in urban settings without a water source. We fill the barrels to start with and the rain does the rest. I've attached a picture of a two barrel set up with one saucer filling both." From Pine Mountain School in Kentucky. They use our product in the Appalachia community to promote gardening because " many of our participants have gardens that are not located right next to their houses or are only accessible by foot, we wanted to provide rain barrels that could be placed directly at the garden site, rather than at the house." "I really like the RainSaucer. 65 gallons of rain water from 3 days of on and off rain in central New York - Seneca Lake of the Finger Lakes Region. 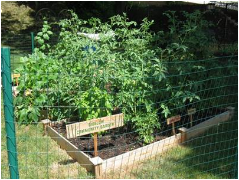 I attach soaker hoses to drain into raised beds of perennials and veggies." 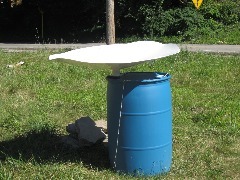 "(The RainSaucer) has served us well. 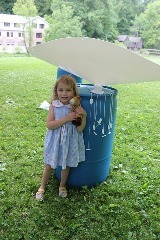 We use the rain saucer to collect water out in Gaia's Community Garden in Pittsburgh, PA"
Customer from West Virginia writes "The Rainsaucer was an excellent invention and it is holding up very well. 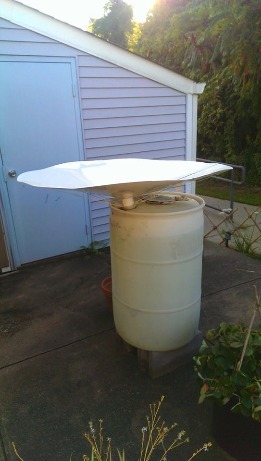 I attached this photo of my Rainsaucer setup, and I want to say thank you again." Jim G. in Fairfield, CT wrote us "We here at Bigelow Tea loved our RainSaucer and how well it complemented our Community garden. Not having a downspout was challenging but we knew we wanted to collect rain water that could be used for watering our garden; in addition to saving water, the temperature of the rain water is better for the plants as it is closer to its natural environment then city supplied water. ..." Photo shows the RainSaucer in the background. "I live in a Mediterranean climate in Southern Oregon.... 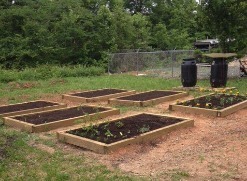 I have 40 fruit trees, 30 raised beds and a medicinal garden...I have 11 rain barrels with a plan to increase them to 25. 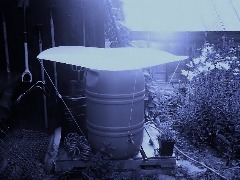 Before Rainsaucers, i was trying to figure out how to capture rainwater in my freestanding rain barrels and coming up with nothing. Now I am beginning to capture water to offset the decreasing precipitation in our region... Another small benefit is that when I do bio-dynamic preps I have all this wonderful rainwater to stir with. 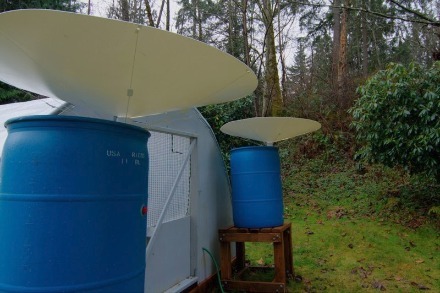 I am a dyed in the wool Rainsaucer fan and as my budget allows I am going to rainsaucer all my barrels and keep adding barrels and rainsaucers until I am prepared for climate change."